One normally wouldn’t expect much from a comedy released in the sluggish chill of January, but I hoped that The Dilemma might prove an exception to the rule when I noticed that it had been directed by Ron Howard. In movies such as Splash, Parenthood and Cocoon, Howard has shown a flair for comedy that’s not afraid to add a bit of feeling and relevance to its laugh mix. My advice: Call The Dilemma a mistake for everyone involved. Harbor no hard feelings, and move on. This comedy about the ways lack of trust undermines relationships includes moments that are downright ugly — a fight involving a baseball bat and an impromptu blow torch, for example — and little that’s either insightful or funny. 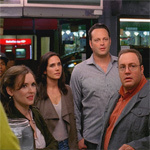 A paunchy looking Vince Vaughn plays Ronny, a Chicago man who discovers that the wife (Winona Ryder) of his best friend and business partner (Kevin James), is cheating. To tell or not to tell? That’s the question that plagues Vaughn’s Ronny throughout the movie, which also features Jennifer Connelly as Ronny’s girlfriend. Vaughn’s glib shtick — by now too familiar to be amusing — puts James in the position of playing straight man. Ronny, a recovering compulsive gambler, and Nick, an engineer with confidence problems, run an engine design company. They’re trying to sell their variation on an electric motor to Dodge, where an outspoken consultant (a wasted Queen Latifah) has been assigned to their case. Comedies can, of course, be made about almost anything, including infidelity, but this one misjudges the value of its serious side and overestimates its laugh potential. The movie’s first scene poses a reasonably interesting question: Can we ever really know someone, even a spouse? I’m not sure I have an answer, but I think we can tell when a movie misses: The Dilemma definitely does.